This is a Photoshop template for a homeschool diploma from high school. Click on the graphic or the link to download the full-sized Photoshop file to your computer. On the Seventh day of June in the year Two Thousand …. I created it to nestle in the center of some bordered certificate paper that I bought at the office supply store. You will need to have Photoshop installed or subscribed to on your computer, Mac or Windows, in order to make use of and edit this document. You will need to have named your homeschool. To edit to suit your purposes, download the DIPLOMA.TTF font here first, expand the .zip file, and install in your system’s font directory. You need only one of the font files below, as they are both the same font, and the Photoshop template for a homeschool diploma. 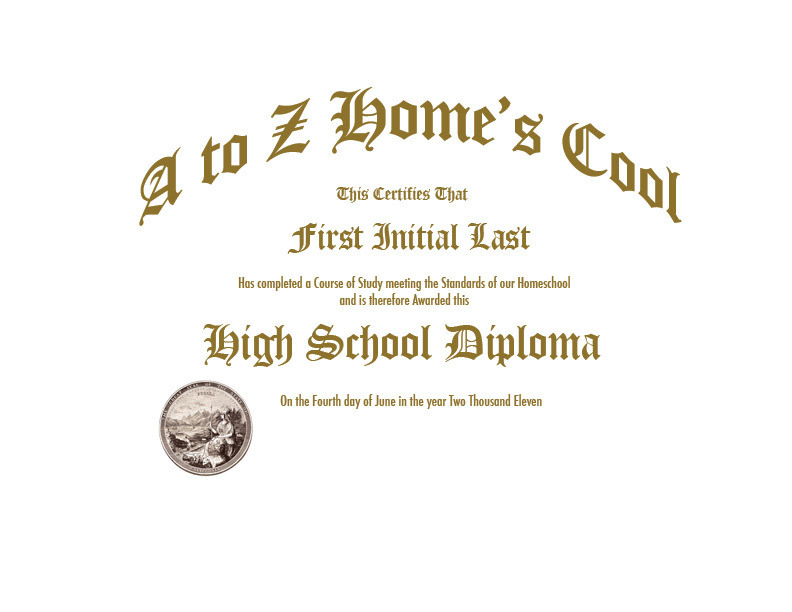 You may want to create a seal for your diploma or look for reasonable clipart on the internet. Select your state. territory, or even Washington D.C.
Parents need to remember to sign the diploma! Your choice of 8 different styles of diploma templates in easy to print pdf format. Put “certificate” in the search engine on your favorite stationery store site. Select “acid free” paper. Search for an 8-1/2 x 11″ diploma frame, too.